iBackup Extractor is an iPhone backup explorer that allows you to browse your iPhone, iPod Touch and iPad backups. To view the backed up files and folders in your iOS device backup click on the "Backup Explorer" icon in the categories list. 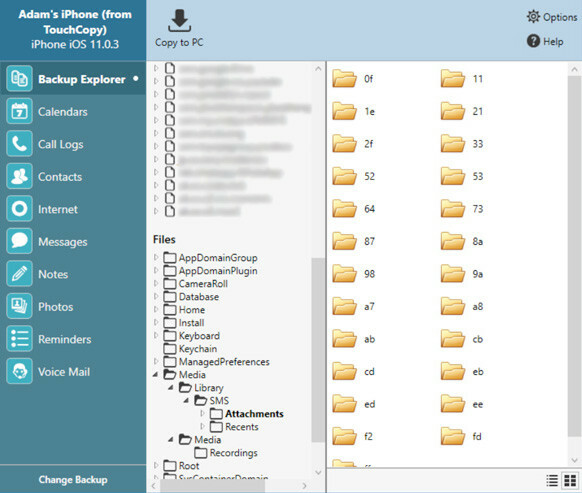 In this tab, you can navigate through folders and files in your iPhone backup as you would through files and folders on your computer. The demo version of iBackup Extractor can extract 20 items from your iPhone, iPod Touch or iPad backup completely free of charge, so why not try it out? Simply select the files or folders you wish to copy from your backup to your computer and click the "Copy To PC" or "Copy To Mac" button. Then choose the location on your computer where you wish to save your files and click OK.